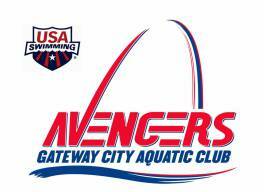 The Gateway City Aquatic Club is now offering swim and safety lessons through their "Avenger Swim School". Children ages 4 and older will be taught basic skills to more advanced skills according to their ability. Lessons are progressive, so attendance is crucial to a child's success. With the use of underwater swim mirrors, noodles, and other fun equipment, children will learn to be comfortable and confident in and around the water. Classes are limited to no more than 6 students, and all classes are taught with excellence by experienced swimmers and directly supervised by USA Swim Coaches. Each class is 45 minutes in length. Space and classes are limited! Sibling Discounts: 20% off additional children - session fee only! Gateway City Masters is a new, developing aquatic fitness program open to all adult swimmers (fitness, tri-athlete, competitive, and non-competitive) who are dedicated to improving their fitness through swimming. Coached workouts for all skill levels will be provided along with instruction in stroke technique. Opportunities will be offered for pool and open water races, to those who are interested. This program is designed to help swimmers improve their fitness and/or train for specific goals, and offer active support for a healthy lifestyle through friendship, fun and camaraderie. Swimming is a healthy, lifelong sport, no matter what your age! So, what are you waiting for? Grab your suit, cap, goggles, and towel and let's get swimming! Please call Coach Jamie for more information/registration (314) 884-0824.